In this part, we will explore the meaning of Dhyana Shloka 4. As in the previous Dhyana Shloka, the basic nucleus in this one is also ‘Vishnum Vande’ meaning ‘I salute Lord Vishnu’. In continuation of the previous Shloka, Veda Vyasa resorts to one more Shloka to help create a vivid image of Bhagavan Vishnu in our mind. Meghashyaamam – In the previous Shloka, He was described as ‘Megha Varnam’ denoting his complexion to be like that of a rain cloud. In this Shloka this aspect is again emphasised wherein He is described as Meghashyamam meaning that He is deep dark blue in colour that is close to a tint of black. Interestingly, there is a song in a Hindi movie where Lord is said to ask Yashoda as to why Radha is fair in colour and why is He dark? 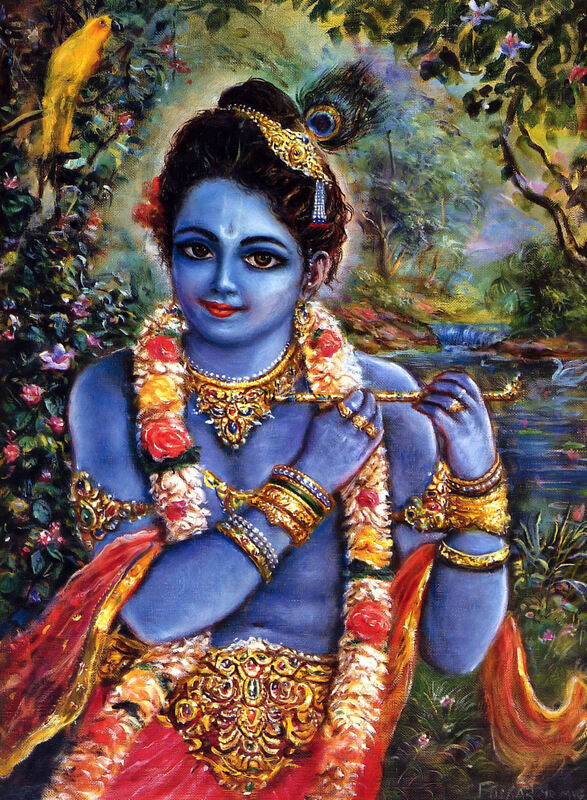 Yashoda responds to Him in that song that since He was born on a dark night, He has a dark complexion! PeetaKowsheyaVaasam – Peeta means yellow and Kowsha is the cocoon of a silk worm, so Kowsheya means silk while Vaasam means attire. 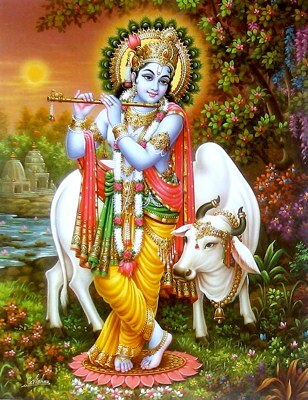 He is adorned in Yellow Silk attire (Vastram). ShreeVatsaankam – Ankam is a mark. He carries a prominent mark called ShreeVatsam on the right side of His chest denoting the presence of Goddess Lakshmi. Hence He is also known as SriVatsan or Srivatsavasa the bearer of SriVatsam. There are many different interpretations about the origin of this mark. A lock of hair on the right side of His chest. The seat of Lakshmi on His chest. 3. The mark as a result of Maharishi Bhrigu’s kick. The Story of Maharishi Bhrigu. Many great sages gathered at the bank of river Saraswati to participate in Maha Yagna organised at that time. They could not decide that out of the Trinity, Lord Vishnu, Brahma and Shiva who is pre-eminent and to whom should they offer Pradhanta (Master) of that Yagna. With the consent of all the great saints present there, it was decided that Maharishi Bhrigu, a sage with an extra eye in the sole of his foot, will be tasked to conduct a test and conclude who was the pre-eminent amongst them. Mah arishi Bhrigu decided to test Lord Brahma first. As Maharishi reached Brahmaloka, he was dismayed at Brahma for not taking notice of him. Angered by this insult, Maharishi Bhrigu cursed Lord Brahma that no one will worship Brahma in Kaliyug. To this day, there are very few temples devoted to Lord Brahma (with the notable exception being the Brahma Temple at Pushkar in Rajasthan). Maharishi Bhrigu then decided to visit Lord Shiva at Mount Kailash. Nandi stopped him from entering inside, as Shiva and Parvati were in private chambers. Bhrigu doesn’t pay heed to Nandi and forcibly enters Lord Shiva’s private chambers. Lord Shiva, who was in unison with his consort Goddess Parvati, on seeing Bhrigu was enraged. He said to Bhrigu “you are a learned man, who knows the Vedas. By great penance you have acquired great powers, yet you have behaved impertinently. It is shame on your part.” Lord Shiva, angrily, aimed his Trishul towards Bhrigu. Finally Bhrigu Maharshi reached Vaikuntam, where Lord Vishnu resides. Lord Vishnu also did not notice him; the sage was exasperated and kicked the Lord on His chest, the place where Mahalakshmi resides. Vishnu, in an attempt to allay the sage, got hold of the legs of Brighu Maharshi and started to press them gently and pretended as if he is soothing and comforting the sage. 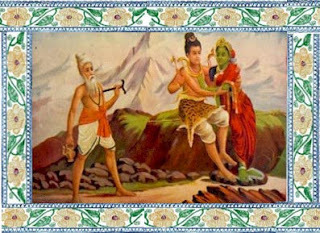 During this act, Lord Vishnu cleverly squashed the extra eye that was present in the sole of Bhrigu’s foot. The extra eye is considered as a symbolism of sage’s egotism and his special powers. 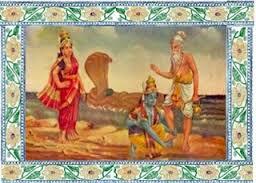 The sage then comprehended his dire mistake and apologized to Lord Vishnu. Bhrigu was pleased and declared him Supreme amongst the Tridev. However, Sri Mahalakshmi who witnessed the scene was angered by the apologetic action of Lord Vishnu, and in a fit of anger left Vaikuntha. 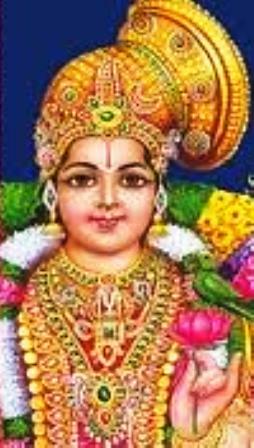 Vishnu reached Bhoolokam in search of Mahalakshmi and took abode in an ant-hill under a tamarind tree, beside a pushkarini on the Venkatadri Hill (now known as Tirupati). The story of Lord Venkateswara begins here, which we will cover later. Koustubhotbhaasitaangam – Kaustubham is a gem, Udbhaasita means adorned with and Anga is a part of the body which in this is instance denotes the chest. His chest is adorned with the brilliant Kaustubha gem. 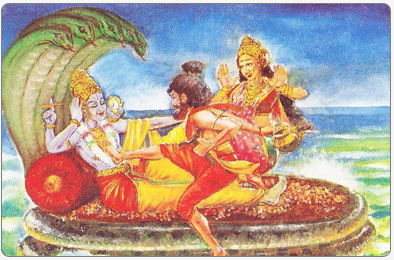 Kaustubham was fifth of the thirteen treasures that emerged from the churning of the Milky Ocean by the Devas and the Asuras for obtaining nectar. Ever since it has adorned the Lord’s chest and forms part of His iconography. It represents the brilliance of the Sun and is symbolic of pure consciousness devoid of subjective qualities. Punyopetam – Punya refers to the blessed persons. Upetam means surrounded by. He is surrounded by persons who are blessed or who have earned Punya by doing righteous deeds. The idea is that only persons with accumulated Punya or good deeds of several births can reach Him. Meaning: But those persons performing virtuous actions (in thoughts, words and deeds) have their sins completely eradicated because of this; they being free from delusions of duality, consciously and with determination engage in devotional service, reach unto Me. In another Shloka he says ‘Bhajanti tvaam dhanyaah katichana chidaananda lahareem’ meaning ‘only a few blessed ones can really immerse themselves in your divine bliss’. Pundareekaayataaksham – It is an expansion of the term ‘Kamalanayanam’ which we saw in the last Shloka. Pundareeka means Lotus, Aayata means long and wide and Aksha means the eye. Pundareekaayataaksham means – Eyes are long and wide as beautiful as the Lotus flower. There is an interesting episode in the life story of Sri Ramanuja. Acharya Ramanuja was a student of Yadavaprakasa. One day, Yadavaprakasa, while teaching the passage from Chandogya Upanishad came up with an interpretation of the Upanishad that was unacceptable to Ramanuja. The text in Chandogya Upanishad which states: “tasya yatha kapyaasam pundarikam evam akshini.” While explaining the line, Yadavaprakasa said the eyes were red like the posterior of a kapi (monkey). The explanation caused great anguish to Ramanuja as he was distressed on how could the Supreme One’s eyes be compared to the posterior of a monkey? Ramanuja pointed out to his teacher that there were three other acceptable explanations for the line. The Sun is also referred to by the word ‘kapi’. In the context of the Upanishad, the reference to the word kapi cannot mean a monkey, but it has to mean the Sun, declared Ramanuja. So in this instance, it should not to be interpreted as a monkey. Instead it should be interpreted as the Sun which causes the Lotus to bloom. There is yet another meaning for the word ‘kapi’ as stem of a Lotus. As long as a Lotus flower is not snipped from its stem, it retains its freshness. So the line from the Upanishad could also mean that the Supreme One’s eyes have the freshness of Lotus flowers sitting on their stem. Another way of interpreting the statement from the Upanishad could be that His eyes are like Lotus flowers in a pond. In his Vedartha Sangraha, Ramanuja integrates all three interpretations and presents them beautifully. Yadavaprakasa was himself a great scholar, and yet why did such interpretations not occur to him? 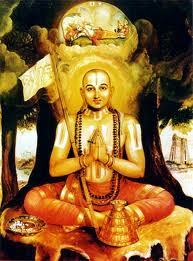 The answer probably was because Ramanuja had studied Andal’s Thiruppavai thoroughly. You should grace us with your divine glances, with your eyes that resemble a Lotus bud now, and as the Sun rises, like the Lotus bud slowly unfolds into full bloom, so shall you in a similar way open your eyes slowly and bless us all thereby relieving us of all our sins and thus grant us eternal bliss. Ramanuja was, perhaps, inspired by this pasuram from Thiruppavai. 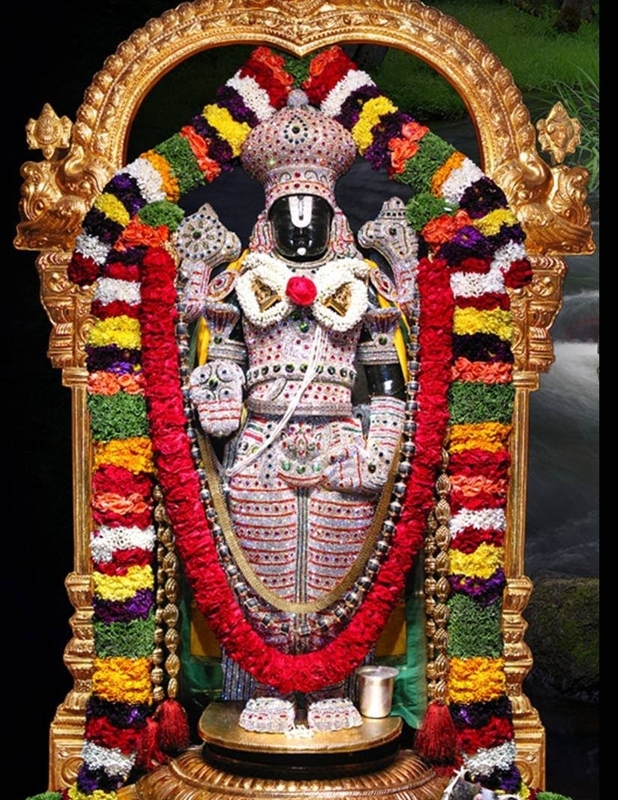 Vande Vishnum – I Salute Lord Vishnu. Sarvalokaikanatham – As we have already seen in the last Shloka, Sarva means all; Loka means world; Eka means only and Natha means leader or head. He is the one and the only Head of all worlds meaning the Lord of the Universe. To sum up, this is the full vivid picture. Who is the undisputed Lord of the Universe. Vivid explanation, my purpose of visit to this site was fulfilled. Thanks. Thank you Sathish ji. God bless you! Hari Om!!! Your explanation is so clear and coherent. I refer to your blog for all my research work. Thank you! Thank you Geetha ji 🙂 Such a compliment coming from an accomplished artist like you, is indeed encouraging! DEAR SIR, I AM VERY VERY HAPPY TO SAY LIKE THIS WITH MORE AND MORE SPIRITUAL INFORMATIONS OF OUR SHRIVAISHNAVISM CULT SHOULD BE DEVELOPED BY YOU SIR LIKE DESHIKA PRABHANDAM,NALAYEERA DIVYA PRABHANDHAMS ETC., SHOLD COME UP I AM EXPECTING BY YOU LIKE SHRI VISHNU SAHASRANAMAM SHRI VAINATHEYA,CHENNAKESHAVA,SOWMYA NAYAKI THAYAR SAMETHA ANJANEYAR SHLOKAMS LIKE HANUMAN CHALISA ETC., THANKING YOU IN ANTICIPATION, AND EXPECTING MORE AND MORE SHAKTHI TO YOU FOR PUBLISHING OF THE ABOVESAID PROGRAMMES GRADUALLY BY EMINENT SCHOLARS I AM EXPECTING FROM YOU SIR. ADIEN…. Pranam! Thank you for your kind words. I do wish to write on other scriptures too over time with His divine grace! Hari Om! Awesome! Amazing! Love to read more and more of this. Thanks a lot! Very nice quotes from Soundaryalahiri and Thiruppavai. Let the Lord Mahavishnu gives His blessings and Satsang to all.Thank you. Its a wonderful presentation of lord vishnus beauty. Here i wud say some thing. “Kasthuri thilakam. ..Lalata patale.. vakshasthale kousthubam.. nasagre nava moukthikam..karathale venum..kare kanganam..kanthe cha moukthavalim.sarvange hari chandanasya kalayam….gopasthri pari veshtitho..vijayate gopala choodamanim…Here the beauti of lord vishnu is explained in his krishnavatharam..as this one is considerd his one of important and sequential ine where he preached geetha .the whole lifes essence.. Thank u Sridhar for tagging me and i appreciate ur knowledge.in varius fields..